Ferrybank A.C. held their annual Open Track & Field Day in Waterford last Sunday. It was a good day for running with little wind and an air temperature that was neither too warm nor too cold. There was a very good attendance with clubs from counties Waterford, Kilkenny, Cork, Tipperary, Wexford, Carlow, Dublin and Meath. For most athletes this was their first outdoor meet of the new track & field season, a welcome opportunity to shake the Winter lead from the legs. Athletes from Co. Wexford clubs made a big impression making off, at day’s end, with a sizeable haul of medals. 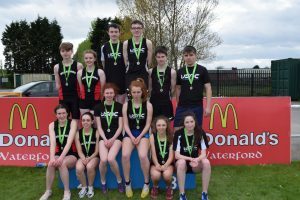 Several athletes made the podium in more than one event including Aaron Browne (United Striders AC) – Gold in the U16 100m and 800m; Maeve Hayes (St Paul’s AC) – Gold in U16 Hurdles and High Jump, Silver in Shot; Jack Forde of St Killian’s AC won Gold in the High Jump (U16) and Silver medals in the U15 100m and Shot Putt. Orla Byrne (SBR), Saidhbhe (Enniscorthy AC) and a sextet of Bree AC athletes – Abbie Doyle, Gracie Keogh, Jayden Kenny, Shane Laffan, Ciara Laffan and Leah Bolger – all won multiple medals. Along with the high achievers listed above several other athletes caught the eye. In the Girls U16 100m, April Keeling (Menapians AC) looked very impressive, running a strong and well-controlled race from gun to tape. Striders athlete Patrick Doyle gave a fine display of hurdling in the U16 80m Hurdles. DMP’s U11 boys Kevin O’Mahoney and Michael Kent looked good as they took Gold in the sprint and the turbo javelin respectively. 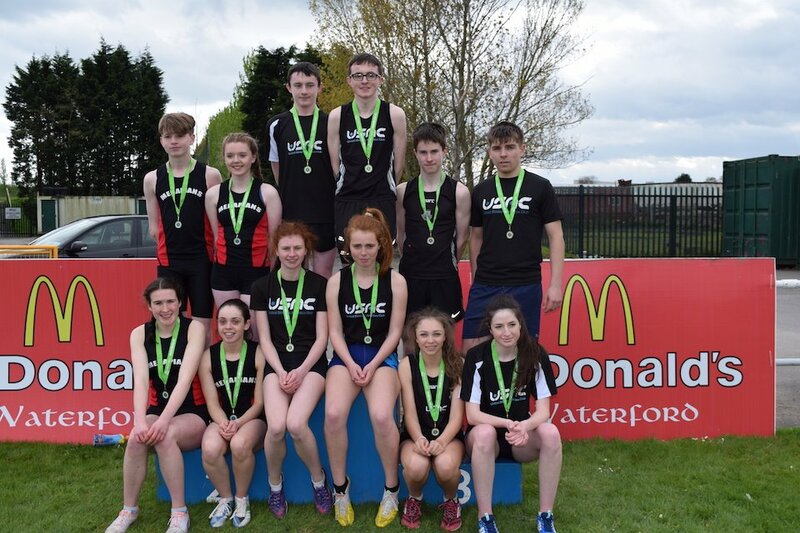 There were also Golds for Patrick Doyle (USAC) in U16 80m Hurdles, Stephanie Deegan (SBR) in U11 Turbo Javelin, Sean O’Brien (USAC) in U10 300m, Niamh White (Menapians AC) in U9 Turbo Javelin, Judy Sinnott (DMP) in U8 60m. The Menapians AC trio of Róisín O’Reilly (U16), Sinéad O’Reilly (U13) and Danika Gilshinan (U15), along with USAC’s Myles Hewlett (U13), had success at the longer distances winning Gold, Gold, Silver and Bronze respectively. USAC’s Eve Byrne and Joanne Kelly made it a 1-2 in the Juvenile Women ’s 1500m Race Walk. Bree came away with two sets of relay medals – Gold in U11 Girls and Bronze in U9 Boys. United Striders AC took Silver in U15 Boys Relay. In the U17 Mixed Relay it was a clean-sweep for the county with a fast-finishing Aaron Browne ensuring Gold for USAC followed by Menapians in 2nd and the USAC ‘B’ Team in 3rd. Regardless of the colour of the medal, this was a really good day for the county’s young athletes. The results augur well for the county’s prospects in the season ahead. Well done to all and credit to their coaches for having prepared them so well. Tagged Ferrybank Open Sports, Waterford RSC, Wexford Track & Field. Bookmark the permalink.